I watched youtube videos of SSMS running two different queries and the last result was displayed below the last table. Example that I am referring in youtube. Now when I run a new query It does not conserve the last table there, I only can see the last result table. I want to see the last two or three tables there in the same windows to compare them, Is it possible? Yes, actually if you run two queries at the same time it should automatically display to separate windows with the result. Not the answer you're looking for? Browse other questions tagged sql-server ssms windows-10 or ask your own question. 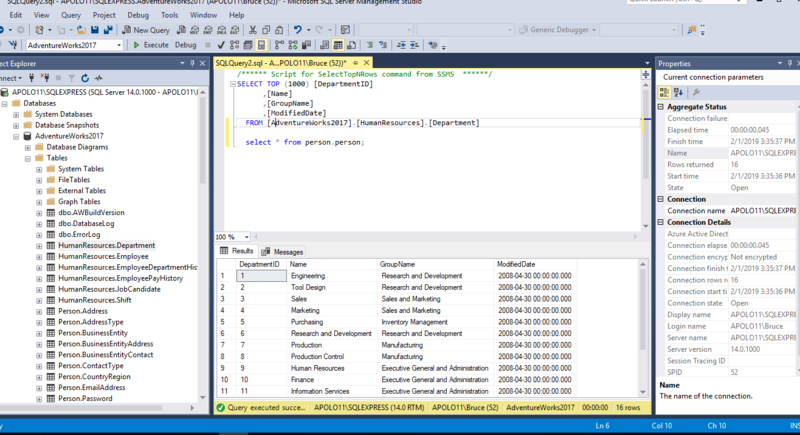 Why evaluates “IS NULL” in SSMS interactive mode to “TRUE” but the same statement being executed in a SP to “FALSE”? How can I optimize this query over this logging table?